After putting August behind us, the weather is beginning to cool down. Last week it was about ninety degrees outside, but somehow the world seems to know that it's September, meaning fall, and with the new month comes the cooler weather. I've been just beginning to break out the sweaters and cozy socks, we're not in the full on autumn season yet, but it's definitely right around the corner. 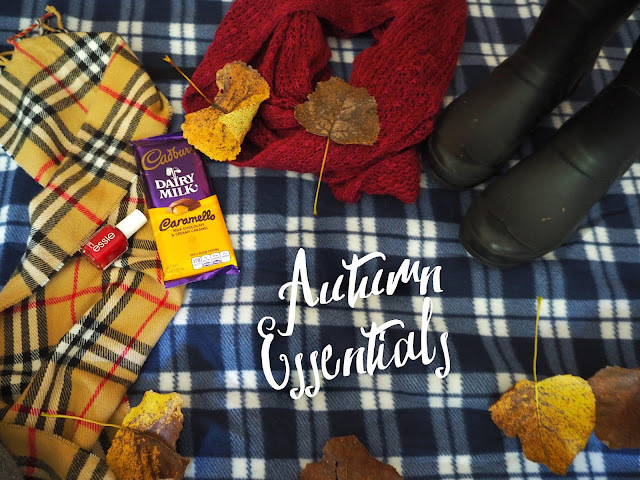 Since we're bidding farewell to the warm summer days and saying hello to the chilly autumn nights, I've definitely made some changes to things that I wear, but there are a few things that are absolutely essential. Let's just be honest, Hunter boots are an all around bundle of joy. These boots go with absolutely everything, riding boots are also great for the season, but rain boots are much more versatile than riding boots. When I wear my riding boots, I'm always careful not to ruin the leather, but with rain boots, I'm completely carefree. Autumn is the perfect time to break out the boots! This time of the year is referred to as "sweater weather" for a reason. Sure, I love wearing shorts and sundresses, but I practically live in sweaters for the rest of the year! Sweaters can be super fashionable, but also amazingly comfortable, almost like you're in pajamas. That's something that I can never feel while wearing shorts. I'm pretty much obsessed with any sweater that's cable knitted, this one from H&M isn't cable knitted, but it does have one of the statement fall colors. Fall accessories are not to be forgotten! Whenever autumn arrives I always break out the statement necklaces, because during the colder months I can get away with wearing a simple sweater and dressing it up with a pretty necklace. This one with leaves pretty much shouts autumn and I always jump at the chance to get to wear it in the fall. I picked this up a couple years ago at Old Navy and never stopped loving it for a second. The transition from bold and vibrant colors to warmer toned autumn colored nail polishes is actually something that I look forward to. I can't pull off a bright colored nail polish and generally opt for a red nail polish (timeless, but perfect for the fall!). Continuing on with accessories, I can't not mention scarves in an autumn essentials post. I was personally not a scarf person in the past, but recently I've been liking the idea of wearing scarves more often, because they keep you cozy and can also dress up a simple sweater or outfit. I usually wear infinity scarves if I do wear one, I have one that's maroon, which is absolutely perfect for the fall, but I also have another classic scarf with a plaid pattern that is so typically fall. And along with the sweaters, it's time to break out the button downs. If you couldn't tell already, I love wearing simple sweaters and adding something around the neckline to dress it up, whether it's with a necklace, a scarf, or a collared shirt. And even better? A button down in burgundy. Burgundy and maroon are definitely my favorite colors to wear during this season, mostly because the color is more flattering with my skin tone and it's a beautiful color that captures the essence of the season. Since I've been mentioning this cozy theme a lot, me talking about socks is inevitable. In the past, I really wasn't that excited about socks, I just wore them with my sneakers or whenever I needed to wear them. However, I recently learned to appreciate them more and more. I don't wear socks around the house, but I love wearing knee high socks with my boots, with the knitted pattern peeking out. It's definitely comfortable and they keep my feet warm while acting as an accessory in a way. I threw this in at the last minute, but why not mention food? As a certified foodie, I'm not going to pass on the opportunity to gush about the abundance of caramel during this season. Today I actually picked up a salted caramel mocha (which was loaded with sugar, but I still appreciated the fall essence) and I spontaneously got some caramel filled chocolate while doing my normal grocery shopping. This season is the peak season for caramel and I'm going to take this chance up for sure. So maybe it's not so bad that summer is gone, because the spirit of Autumn is beautifully unique. There's just something about the excitement of wearing warm and cozy clothes that has me looking forward to it. But then again, maybe it's just my excitement for caramel and the cider mill, but who knows? Writing this post definitely got me in the mindset for the season and the excitement came along with it as well! Love your blog Rebecca! My Hunter boots are a essential for me where I live! Thanks, Olivia! Hunter boots are always an essential.